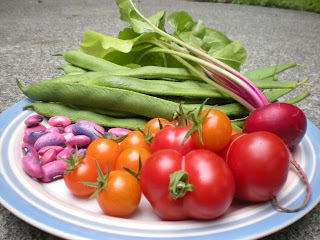 So I went out to harvest some beans this morning at our garden at work. I was shocked to discover, upon shelling them, that they are purple and pink! How is it that I knew so little about what I was planting? Either that, or, as one of the residents here at the youth housing program (my workplace) speculates, they have just taken on the energy of the house. 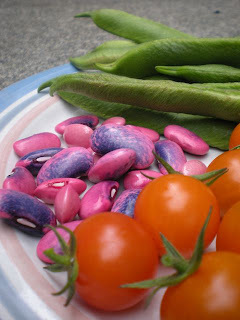 It's an LGBTQ-focused program, and we've ended up with pink beans, purple carrots, and a squash plant that a resident (as documented in a previous post) identified as gay because it was producing only male flowers for the first month of its flowering life. The youth (age 20) who speculated this morning (about the influence of the house's energy on the garden) identifies as female and will be beginning the biological transformation to female in the next couple months. She has not spent much time in the garden, but was suddenly very excited by these pink beans. 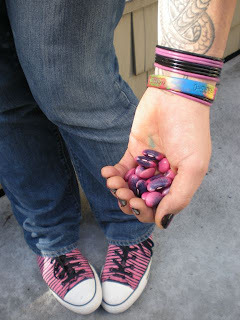 "Outside, it's like any other bean," she ruminated, "but inside, it's pink." It's so easy to be critical of people for failing to appreciate the natural world, but who pays attention to things that have no apparent bearing on their lives? For young people navigating their teenage years, broken homes (or the foster care system), and the sexual and gender prejudices of this society, is it any wonder if they take for granted things others of us hold so dear? It's wonderful when you find a way in. This young person asked if she could take the beans to make a necklace. "They match my shoes," she said. I told her she'd have to dry them first. "How?" And suddenly an item from the garden had relevance to her life; had meaning and thus worth. We can talk all we want about teaching kids about the relationship between human beings and the natural world, but until we make that relationship tangible--and recognizably relevant to their lives--can we expect them to pay attention? It turns out you dry beans by leaving them on the bush until the pods are dry and brown. Damn. There's still a few left out there, but we'll see if they're still purple and pink once they're dried. "Who knows, they may turn brown," I said. "Yeah, maybe it will be just a phase," she said, echoing a sentiment she's surely heard many times, sounding tired of it. "But for now," I said, "We'll offer all the support they need." "Cool," she said. "Then we'll eat them." 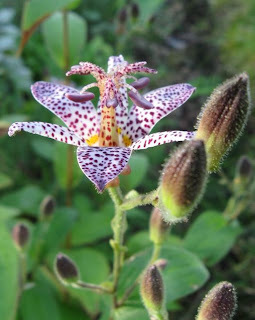 It's "Tricyrtis", according to a reader of this blog, also known as "Toad Lily". Originally found on the rocky slopes of the Himalayas, it now lives in my front yard. SO cool. What a great story of life, Matt. So individual, so tolerant, so real. And tied to the relatable. Should go in some magazine somewhere I think. At least it's on your blog.